Since its founding in 1793, the United States Capitol Building has been an enduring symbol of freedom and the democratic process that happens within its walls. Photos of the building are in no short supply, especially in Washington, D.C., where the 288-foot tall building looms in the skyline. Photos of the inside, though not as prevalent, still make daily appearances in the news. The building is steeped in rich history. Some of the historical narratives invite interpretation or imagination while others are little more than rumors passed down from previous generations. And some historical facts seem more like fiction until you see the photos that bring them to life. A current view of the U.S. Capitol, Room HB-29, which once served as a bakery during the Civil War. 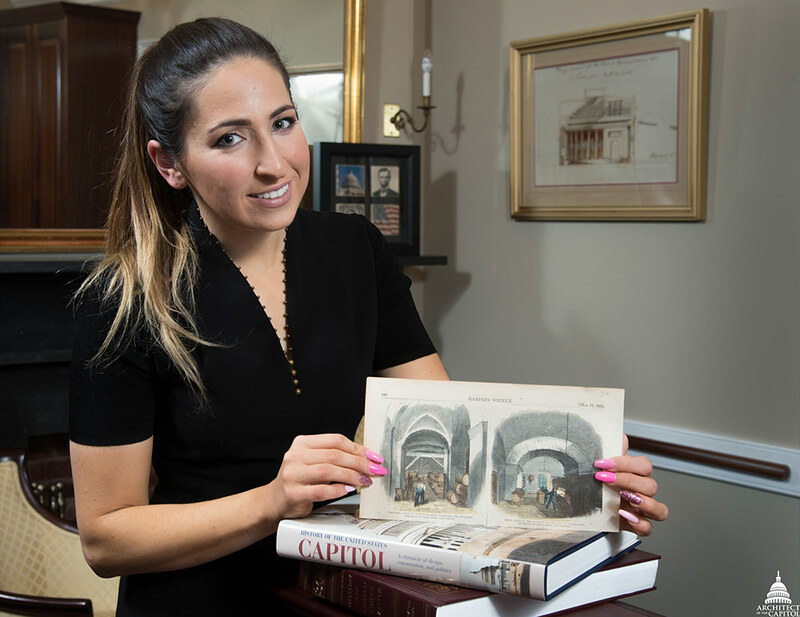 History buff and Executive Assistant Gabriella Marvin had been searching for photos that captured her U.S. Capitol office during the Civil War. Marvin spends her weekdays working for the Architect of the Capitol's (AOC) Capitol Building Superintendent's Office while her weekends are often reserved for two of her favorite things: learning more about history and playing with her dogs, Alvin, Murphy and Roxie. Last summer, she took her dogs to Eastern Market, a bustling marketplace in southeast D.C., in hopes of finding the Civil War era photos. It was a long shot, but as she flipped through dozens of newspaper clippings, she immediately recognized the image she had spent months searching for of the U.S. Capitol; Room HB-29; May 25, 1861. Marvin holds a newspaper clipping that shows what her U.S. Capitol office looked like during the Civil War. 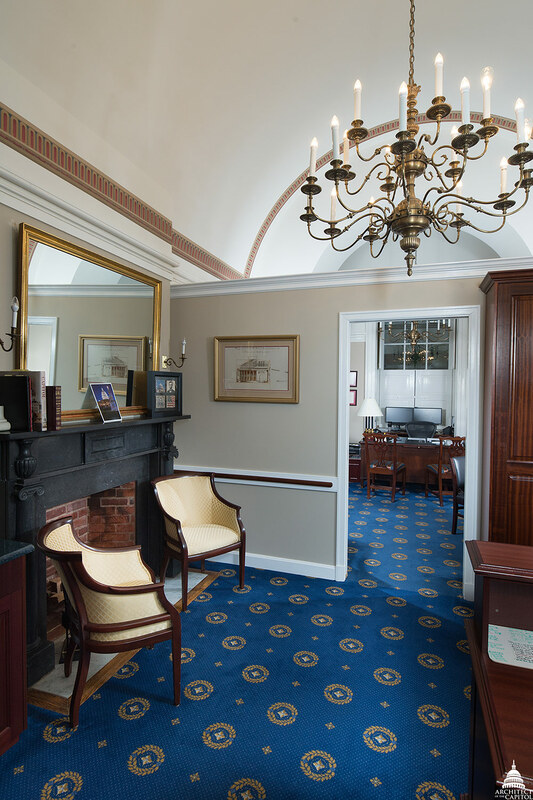 HB-29 is located in the center of the U.S. Capitol and was constructed under the direction of Charles Bulfinch between 1818 and 1826. Bulfinch was one of the first American-born architects of distinction and is honored as the third Architect of the Capitol. His design for the central section of the building included 40 committee rooms, but that space underwent a major transformation during the Civil War. 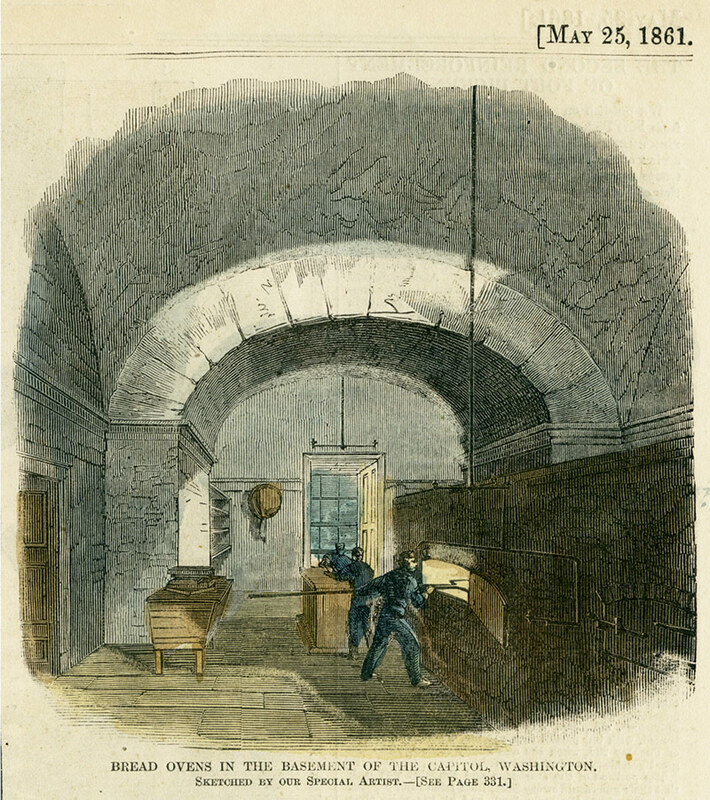 Many temporary accommodations were made for the military at the U.S. Capitol after President Abraham Lincoln ordered Union troops to defend the building and the city of Washington during the war. When Congress was not in session, the House and Senate Chambers were used to house troops for a month, the Rotunda became a makeshift hospital and bakeries were created in the basement and terraces in the center of the building, including in HB-29. Construction for the bakeries began on April 21, 1861, and the large brick ovens were completed on April 28. The ovens were located in HB-29 and HB-28 while HB-27 was used for mixing yeast and other baking operations. Eventually, bakery-related tasks occupied the entire west basement of the center building. In February 1862, a "Harper's Weekly" reporter stated that there were 14 ovens that baked 200 loaves a day, and six or seven ovens that baked 800 loaves a day. The bread was passed out through the windows to troops and freight wagons waiting in the courtyard. An up-close look at the bakery operations in the U.S. Capitol, 1861. The bakeries continued to produce food for the Union armies in the area, even after troops were no longer staying in the U.S. Capitol. Within six months of the bakeries' installation, complaints began pouring in from Capitol occupants who were concerned about the smoke damage the bakeries were causing to other parts of the building. Money for the removal of the bakeries was authorized in July 1862, and they were removed in October of that year. According to AOC records, HB-29 has been occupied by the Architect of the Capitol and support staff since the late 19th century. Marvin has only occupied the space since 2015, but she appreciates the historical significance of her office every day, "Working for the Capitol Building Superintendent has been nothing short of a life-changing experience. From the people I've met to the history I continue to learn about this remarkable building, there is no other place I would rather work. Some days are more challenging than others, but my experiences and the people that surround me make every day worth it."